On September 16, 2013, an article from the Wall Street Journal, reports and discusses the new 6.5% tariff imposed by China on U.S. solar-panel materials. This is thought to be China’s retaliation for a tariff imposed last year on Chinese-made solar cells. Washington enacted the tariffs after determining that the Chinese manufacturers were dumping the goods in the U.S., and had received illegal subsidies. China claims that the tariff is a result of the U.S. dumping of polysilicon in the Chinese market, which accounted for 36% of Chinese polysilicon imports in the first half of 2013. Although China fell short of earlier threats of imposing tariffs as high as 57%, the new tariff could be detrimental to U.S. manufacturers, especially since China is currently the world’s largest producer of solar panels and has announced plans to increase production for the next three years. My thinking goes to the motivation and effectiveness of tariffs. Including this case, it seems that in many instances when tariffs are imposed, the result is political tension and retaliation. Thus, it seems the motivation of imposing tariffs is not fully derived from an economic sense, but also increasingly from a pride/power perspective. The goal of the tariffs has deviated from a regulatory role, to a tool of political chess. In this China-U.S. case, China has allowed for its national solar panel business to take a hit by raising the input prices of polysilicon, albeit exempting three U.S. manufacturers who they cited as only having received minimal subsidies. With countries, especially China, quite willing to participate in tariff wars, perhaps this classic regulatory tool is losing its value in the face of the exponentially interconnected global economy. This text was written and presented by Mr. Sho Shino, Student at the McDonough School of Business of Georgetown University in the course on International Business (STRT-261-01) on September 18th, 2013. You can contact the author here. Ambassador Cuisia of the Philippines anticipates the ongoing rise of Asia. The Philippines are experiencing growth rates of over 6%, and even so ranks only third in Asia. He sees the TPP as bringing a new trade architecture to the world, drawing a line down the middle of the Pacific, and accelerating the dynamics of the Asian marketplace. Due to new strength in Asia, Mr. Cuisia forecast the beginning of a new “Roman Peace” with new allies and alliances forming a counterweight to the current “heavy hitters” in trade. 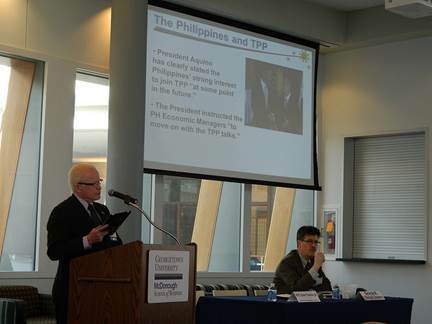 His key message was that the Philippines want to become part of the emerging TPP. Jack Jan, chairman of the Taiwan-U.S. Commercial Forum reiterated the desire of Taiwan to join in with the TPP. That way, Taiwan could offer even more opportunities as a bridge to China. However, in spite of such a desire to join, he warned against the effects of too onerous a cost. Is China taking U.S. Business Secrets? On Tuesday, February 19th, the U.S. Government stated that China’s military is connected to “Comment Crew,” the same hacking group which attacked Coca-Cola, military contractor Lockheed Martin, and the EMA security division RSA, among many others. Comment Crew allegedly has access to blueprints of America’s energy systems and trade secrets to from some of the United State’s largest corporations. The threat of a cyber attack from China can be major and can have negative economic and diplomatic implications. Tom Kellerman, former commissioner of President Obama’s cyber security council and current head of cyber security at Trend Micro, estimates that hundreds of billions of dollars a year could be in jeopardy if trade secrets are being stolen, particularly since it is not one machine but entire systems which are at risk. Along the lines of technology theft, Georgetown University is implementing new security measures for its students with regards to hacking and laptop thefts. Clearly, technology protection is rising to a crucial level of importance.